Manny: As a FFS spouse, I’m generally on the other side of these posts. Cooking is my passion, and as an owner of a full size spit, a mini spit and multiple BBQs, you could say I have a love for meat and fire. So you can imagine my excitement when I was invited, along with “Team FFS” – Vanessa, Bianca and Alex, to a Brazilian BBQ ‘fiesta’ hosted by Vic’s Meat Market and Tramontina. 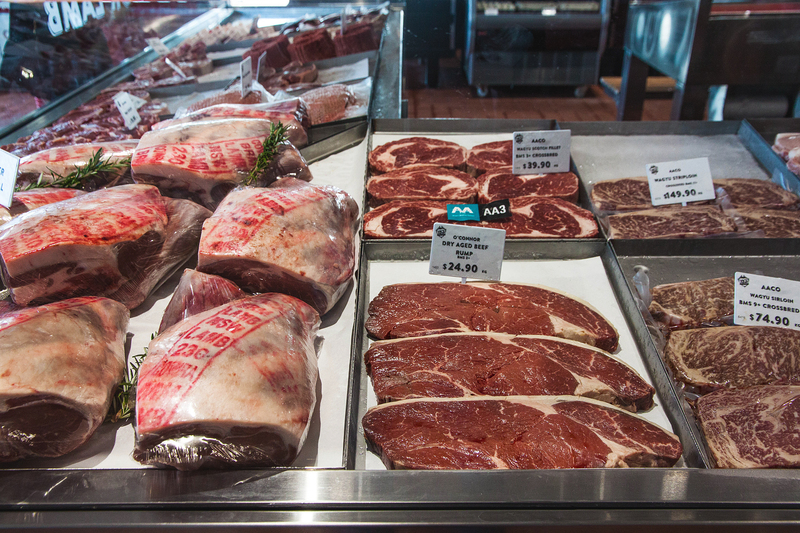 Vic’s Meats is a Sydney institution of fine butchery, supplying our fair city’s every carnivorous need through their wholesale butchery in Mascot and their upmarket retail butchery, Victor Churchill, in Woollahra. Vic’s newest venture is a brave push into seafood territory, with ‘Vic’s Meat Market’ located at Sydney’s iconic fish markets in Pyrmont. Vic’s Meat Market is a shrine to all things a carnivore would love… from dried to fresh meats (in a variety of cuts) and even its own attached BBQ Wagyu Bar, complete with the largest meat smoker outside of the US (as proudly exclaimed by Vic’s CEO Anthony Puharich). Where Vic’s was the gracious host in setting the scene, Tramontina provided the Brazilian flare. A manufacturer of household goods and a large name in Brazil, Vic’s partnership with Tramontina centers on their range of amazing steak knives and BBQ (Churrasco) products. Having owned Tramontina steak knives for over two years, I can vouch for their quality and wow factor when brought to the table. Anthony Puharich was our host, providing a quick rundown of his ambition with Vic’s Meat Market and his genuine love of good meat and quality butchery. With our appetites whet, and stomachs grumbling, we were lead through the store to the restaurant, where Tramontina’s Chef, Juan Carlos Pancorbo, was busily preparing his workspace to demonstrate the preparation of a Churrasco staple… the Picanha! Brazil’s favourite cut of meat, the Picanha, is a premium cut from the cap of the rump, and generally reserved for the more affluent in Brazil. Luckily in Australia, it’s an affordable and accessible cut, found at quality butchers (including Vic’s of course). The preparation of Picanha is simple, cut into 2cm strips and skewered into a ‘C’ shape, it requires just a generous slather of rock salt, with the nice layer of fat at the top of the Picanha providing a natural basting and lots of flavour. Served rare, this was one tender and incredibly tasty piece of meat. Alongside the Picanha, we were served a mix of traditional Brazilian sides. Red kidney beans with chorizo and bacon (Feijao Tropeiro) complemented the meat nicely and were a hearty addition to the BBQ. Caramalized eggplant and capsicum provided a deliciously sweet contrast to break up the heaviness of the meat and beans… and of course, the Chimichurri, which no Brazilian BBQ (or any BBQ really) could be without. Hands down this is my favourite addition to any simple BBQ. Zesty and fresh, with a slight kick from the garlic and chilli, it elevates a beautiful piece of meat into something else entirely (not to mention helping to keep the meat sweats down!). With quality ingredients and a great setting just far enough away from the main markets to avoid the pungent fishiness they’re renowned for, I could think of much worse ways to spend an evening… and boy am I excited to not have to wait for Vic’s Market Day Saturday’s anymore! My love affair with Chimichurri is so great that I couldn’t write about a BBQ experience without providing you with a recipe to make at home for your next BBQ. Recipe courtesy of Tramontina. Finely chop the onions and roughly squash the garlic (so as to infuse the mixture, but not overpower). Crush the dried bay leaves into small flakes (can use your hands), and finely chop parsley and oregano leaves. Combine all prepared ingredients into a bowl, and stir in olive oil, paprika and vinegar. Add salt and pepper to taste and store in refrigerator until required. This can be prepared well in advance, which is a preference as the flavours mature with age. *forfoodsake were invited by 6dc, however all opinions are our own. That wagyu rump cap was pretty awesome. I’ve bought one and did the same at home with my BBQ. I’ll definitely have to drop in the next time that I’m at the Fish Markets for seafood!